As the title hints, Dune is a story about a planet more than a single person. Arrakis is the desert planet known as Dune, which is full of the valuable drug melange (called spice), an addictive drug that is in high demand around the galaxy. Whoever controls the spice controls the universe. Duke Atreides is offered the post of governor of Arrakis, and takes the chance to wrestle Arrakis from the hands of House Harkonnen. The Harkonnens respond by lashing out with the covert backing of the emperor, and they murder the Duke and his house, with only Paul Atreides — the heir — remaining alive. Paul and his mother are run into the desert, where Fremen raiders and the terrifying sandworms rule. The entire empire turns its focus on Arrakis as Atreides, Harkonnen, the Merchant Guild, and the emperor all grapple for control of the valuable spice. Trapped in the desert, Paul and his mother find themselves at the mercy of the Fremen, who have been dismissed as savages by all of the off-planet invaders. Constrained by the desert, the Fremen are ruthless, efficient, and uniquely in touch with Arrakis. They wear skin-suits to recycle their own water, and even possess the secrets of the sandworms, and are able to ride the monstrous worms. Paul and Jessica find themselves becoming Fremen; who believe Paul to be Lisan Al’Gaib, “the voice from the outer world.” They believe he is the one who will lead them to paradise and throw off outside control of Arrakis. There are clear messianic overtones in Dune. Paul is the messiah sent to free the Fremen and redeem Arrakis, and even though these legends have been planted by off-planet operatives hundreds of years ago, strange occurrences begin to lend credence to the myths. Fueled by the visions brought about by a diet of melange, Paul begins to see the future, as it may yet come to pass. He is haunted by a vision of a green and black banner — his banner — held at the front of millions of Fremen as they swept throughout the galaxy on jihad. This is the destiny he encounters and seeks to avoid throughout the story. This is a fantastic and unique novel. Herbert has painted a vivid picture of humanity as it could be in the distant future: greedy, profit-driven, and unscrupulous. He contrasts this with the native Fremen: a stripped-down culture that reveres Paul Muad’Dib and is driven by a desire to reshape Arrakis into a water-filled planet once again. The contrast of these two worlds, and the gradual transition of Paul from one world to another, make up the meat of this novel. Herbert makes particularly strong statements about ecology — again, this novel is about the planet, more so than the people — as well as religion and belief. Muad’Dib is wise in the ways of the desert. Muad’Dib creates his own water. Muad’Dib hides from the sun and travels in the cool night. Muad’Dib is fruitful and multiplies over the land. I was stunned by Herbert’s atmosphere and world-building. He managed to create a more evocative world than anything else I’ve read. Herbert avoids excessive computer and technology in his books, so this definitely doesn’t have the feel of Star Trek or even of Ender’s Game. Instead, Dune feels like the Arabian nights: dim, dusty caverns, blinding heat and sand, back-stabbing and political maneuvering, capped by the thundering of the giant sandworms. Arrakis is a strange, beautiful world. I welcomed the change of pace from white gleaming corridors, giant computers, and lasers. As Paul grows into the Fremen culture, it is presented to us vividly. His mate, Chani, a Fremen, comes alongside him as he joins her clan and becomes a Fremen, to the point of mounting and riding his first sandworm. I loved the world that Herbert painted, and I was reluctant to leave it. The bizarre became the natural, as I seemed to feel a skinsuit on my own skin, or taste the smoky air of a Fremen siatch. Dune hits so many sweet spots in science fiction that it’s no surprise that it’s rated a classic. Much like C.S. Lewis’ Space Trilogy before it, and Ender’s Game after it, Dune pulls sci-fi from it’s usual techno-babble and focuses intensely on humanity. The questions of ecology, politics, faith, and even family are the questions that Herbert brings up time and time again. Dune presents an interesting hope for mankind: equal parts mysticism and practicality: religion and survival. Though the answers may not be all right, this is an intriguing novel with an excellent plot and vivid characterization, all set on a planet that seems almost real. 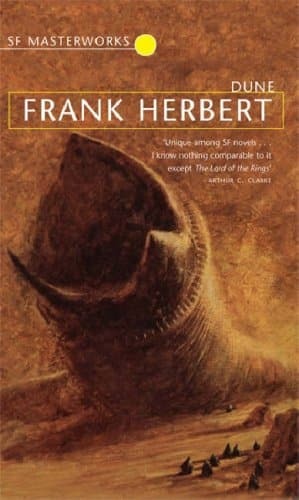 I highly recommend Dune. Note: Herbert’s subject matter can be explicit, or at least frank. Violence especially is prevalent, and sexuality makes appearances as well. Nothing is superfluous or excessive, but it’s this is a book for mature readers who can read with discernment.